We offer proven solutions and services for showcasing your products with the right audience. We specialize in creating and providing equipment shapes and stencils of products from various hardware manufacturers in popular diagramming products like Microsoft Visio which is used by thousands of network and datacenter professionals. We have customized programs which let hardware manufacturers focus on their core business while providing valuable resources to their customers. We'll create stencils of your hardware! "Our customers had long been asking for the capability to easily use our products in Visio, and they are as delighted as we are that these shapes are now available! ... Altima's dedication to the successful development and delivery of our Visio shapes has been exceptional, and we look forward to working with them on additional projects in the future." 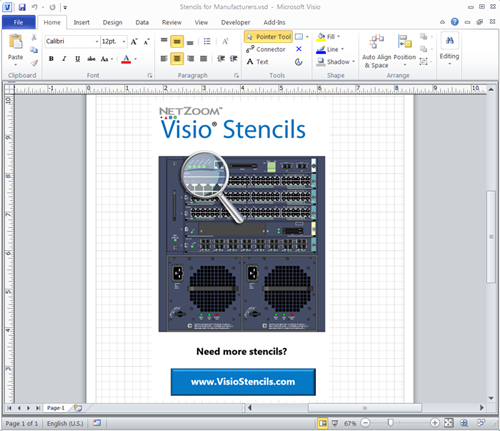 "Visio shapes are an essential aspect of network planning in the data communications market. Anritsu's datacomm test and measurement equipment has better applicability and usefulness to customers because of the Visio shape capabilities that Altima Technologies provides, and that Anritsu relies on."